This week’s slate of games fall nothing short of excellent. Producing three top 10 matchups calls for plenty of NFL talent to go around. In two playoff elimination games, Notre Dame and Miami bring back the 1980s non-conference rivalry and Oklahoma and TCU seemed to have created their Big 12 rivalry series as the margin of victory average in the past five games is just four points. Georgia travels to Auburn for its biggest test since facing Notre Dame in September. Auburn looks to play spoiler to Georgia’s season but the Tigers can still build their resume to push for a playoff spot if all goes to plan. In the Deep South’s Oldest Rivalry, the two playoff hopefuls will have a heavy battle at the line of scrimmage. Auburn’s offensive line, led by senior guard prospect Braden Smith (71), has been dominant in the run game the past couple of weeks. Smith controls his matchup at the point of attack with incredible upper body strength. Georgia’s strong front with the powerful duo of Trenton Thompson (78) and John Atkins (97), will give Smith everything he can handle. Georgia’s Roquan Smith (3) is the nation’s best draft-eligible linebacker and his biggest question moving forward is his overall speed. Smith’s projected 4.6 speed hasn’t yet hindered him in the run game, but with Auburn’s perimeter rushing attack, Smith will have plenty of opportunities to either throw away concerns or raise more questions. Outside of Auburn’s perimeter run game, Smith will have his hands full with the dynamic Kerryon Johnson (21). Johnson continues to impress in between the tackles with patience and vision to find holes upfront. The junior has leads the SEC with 15 touchdowns. Auburn edge rusher Jeff Holland (4) is known for his burst and speed off the snap as a pass rusher, but is still looking to gain brownie points versus the run. Enter: Nick Chubb (27) and Sony Michel (1). Holland impresses with strength at the point of attack and shows the ability to shed blocks in the run game on a consistent basis. Holland, junior, is a first round candidate and his overall run defense may be the only box left slightly unchecked. In a college football playoff elimination game, NFL talent will be plentiful in the primetime matchup. Notre Dame’s anchoring left side of the line controls the point of attack with intellectual play and a powerful presence. Mike McGlinchey (68) is known for his long limbs and stagnating ability to filter through pass rushers but his run blocking is what can get overlooked. Blocking for rising draft prospect Josh Adams (33), McGlinchey and top 10 prospect Quenton Nelson (56) tag team to create a solid running base. McGlinchey and Nelson will look to provide a spark versus a stingy Miami run defense that has seen an improvement in the past two weeks after bouncing back from surrendering 200 yards in three consecutive contests. In the Hurricane interior, Kendrick Norton (7) stands out with outstanding brute strength to lift offensive linemen off their base. Occasionally, Norton uses a swim move that is a hit or miss but still provides enough pressure to rush as a 5-tech end or shift inside. Outside of an improving run defense, Miami is one of the top pass rushing teams in football. With a balanced pass rushing attack, the Batman and Robin (who’s Robin?) duo will have every part of their game tested. McDermott is a polished tackle with tremendous size and power at his left tackle position. His best attribute is in the second level as he can quickly get upfield with light feet and athleticism. He has a strong upper body and if he punches first, it's game over. He isn't a consistent people mover but when determined he will be. Though only reeling in 22 passes this season for 289 yards with three scores, St. Brown still passes the eye test. The junior is a crisp route runner with soft hands and attacking ability. His ball tracking ability and deep speed are two of his most attractive traits. Miami’s Dee Delaney looks to be out again in the secondary, so maybe this is the week that St. Brown and Irish quarterback Brandon Wimbush (7) hit a groove. Nearly solidifying his Heisman win last weekend with a 598-yard performance versus Oklahoma State, Baker Mayfield (6) is making a big case to be, not only college football’s top quarterback in 2017, but also the Draft’s top passer. Mayfield continues to impress with his anticipation skills and arm strength. His skills outside of the physical tools are what have made him great. Though not squaring off head to head, the left tackle position in this game is filled with a couple of future pros. Potential first round selection Orlando Brown (78) continues to impress with above average extension and strength at the point of attack. With good enough movement skills, Brown also impresses in the run game in drive blocking opportunities, obviously, but also when being asked to pull or in a slide protection scenarios. On the other side, TCU left tackle Joseph Noteboom (68) is possibly a fourth to fifth round pick depending on if teams see the potential he brings to the table. With the first edition of the 2017 College Football Playoff poll being released, Alabama sits at No. 2. And even though the top spot belongs to an SEC colleague, Alabama can gain plenty of brownie points with a win versus an improved LSU team to make a case for No. 1. Bedlam occurs early this season and two polarizing quarterbacks will be at the forefront of attention for scouts and fans from all over. After Notre Dame denounced its playoff dreams, NC State is still well in control of its ACC fate. The Wolfpack control their own destiny in the conference. Problem: Clemson is next man up. After having multiple opportunities to capture a huge upset last season, NC State seeks revenge, as Clemson is well aware of what is at stake. Spotlighting the matchup between Notre Dame’s Mike McGlinchey and All-American Wolfpack defensive end Bradley Chubb (#9) in last week’s preview, Chubb is featured again. Chubb squares off with Clemson left tackle Mitch Hyatt (#75). Hyatt versus Chubb is a strength on strength matchup. Hyatt uses his upper body strength and heavy hands to fire into the chest of the defender. Chubb has quick movement skills off the line and exerts his arms quickly to avoid his opponent’s control. Whose quickness will prevail? Chubb’s flexibility is top-notch and his pursuit is NFL caliber already. The senior creates plenty of disruption in the pocket, and did so, even against one of the better tackles in football last weekend. Jaylen Samuels (#1) is a near impossible player to game plan for thanks to his versatility. Though hard to scheme for, Notre Dame held the offensive weapon in check. He shows off nice reliable hands at all kinds of catch points in congested areas or in wide open spaces. He is a dynamic playmaker with the ball in his hands as he can quickly change direction and turn up-field to give plenty of opportunities after the catch. It’s not guaranteed on who will hold responsibility of Samuels on the Tiger defense based on the versatile roles. The prospects headlined in the Bedlam showdown are ever so polarizing. Oklahoma quarterback Baker Mayfield (#6) has the arm strength, anticipation and instincts that have made him thrive in a wide open Sooner offense, but his off-the-field rumors blind some spectators in buying into his ability. Oklahoma State pocket passer Mason Rudolph (#4) leads the country in passing yards per game but doubts have been expressed on his overall arm talent and pocket presence. Though the matchup between Ogbonnia Okoronkwo (#31) and Aaron Cochran (#78) is an intriguing one for the next level, watching how Rudolph reacts to the pressure of Okoronkwo attracts more attention. Rudolph has ideal pocket presence but when the pocket breaks down, Rudolph doesn’t show much creativity. The senior shows some discomfort when having to roll out of the tackle box and his accuracy suffers. This weekend may shine light on that. Trying to contain The Cowboys’ talented receiving corps is a tall order for the Oklahoma secondary. James Washington (#28) headlines the group as the NCAA’s active career leader in receiving yards. Washington wins with elite-level body control, top-notch ball tracking skills and winning at the catch point on a consistent basis. He partners with Marcell Ateman (#3) to create one of the better receiving duos in college football. Ateman attacks the ball with strong mitts and comes down with congested catches on a consistent basis. Trying to prevent the big play receivers for being just that is Jordan Thomas (#7). The 6-foot, 186-pound cornerback can match the physicality of the duo of receivers and the overall speed and quickness with good enough change of direction skills. Thomas held his own versus big-bodied wide receiver Allen Lazard of Iowa State but had moments where he could not match the physical nature. This will be key versus the Cowboy duo. Don’t let the six straight victories for the Tide tell you that this showdown has not been competitive. Though the Tide has a 140-63 scoring average over that span, the physicality of LSU has not been lacking. In a defensive struggle last year, the Tide prevailed to a 10-0 victory but LSU showcased plenty of defensive standouts. This season, Arden Key (#49) is the main focus of the Tiger defense. Key is known for his pass rushing ability with exceptional first step quickness and length with underrated power, but his run defense comes up often in scouting evaluations. Alabama’s physical offensive front, plus its physical running style of Bo Scarbrough (#9) and Damien Harris (#34), will give Key plenty of opportunities to answer the call. Based on recent history in this series, LSU’s passing attack will be near dormant. Not only because of the pressure Alabama puts on the backfield but from the lockdown ability the Alabama defensive backs put on the receiving corps. Former walk-on and now Pro Football Focus star, Levi Wallace (#39) has been near impeccable for the Tide this year. Wallace has controlled movements and receiver-like ball skills in the secondary. Though showing plenty of physical skills with good enough speed, Wallace has shown the inadequacies of staying on par with receivers when having to turn and run. His upright stature and slight hitch when changing direction could cause for issues versus speedy LSU wideout DJ Chark (#7). ​After a week off from the preview, we’re back at it. Last week’s slate displayed the major contenders and overrated pretenders. After a 506-yard offensive performance, Penn State throttled No. 19 Michigan 42-13. Saquon Barkley and Trace McSorley accounted for 92 percent of the offensive production. Notre Dame also packed a punch on Saturday night annihilating the Trojans of USC 49-14 in South Bend. The USC quarterback Sam Darnold rumors of staying in school continue to surface, especially as he continues to show a trend of turnovers and average performances. The afternoon/evening kickoff is the most intriguing period of Saturday’s slate. Three matchups featuring Top 25 teams square off with heavy conference and national implications. Penn State and Ohio State isn’t an elimination game for the Nittany Lions but very well could end the Buckeyes’ playoff hopes if it drops the ball at home. Notre Dame drew plenty of national attention in its previous wins this season but now has an expectation to live up to with its crushing win last weekend. It doesn’t get any easier with a hot NC State squad rolling into town. Speaking of hot teams, Iowa State enters the week in the Top 25 for the first time in 12 seasons. Its gift? Play host to No. 4 TCU. Here are some players to watch and matchups to highlight this weekend with a focus on draft-eligible players. Highlighted by a quarterback duel, Will Grier (#7) and Mason Rudolph (#2) square off to accentuate the thrills of Big 12 football. Grier has been playing solid football away from the spotlight as the junior leads the nation in passing touchdowns (26) and has tossed 13 in the past three weeks. Grier shows off with plenty of arm strength but his deep ball accuracy is his biggest strength. The 6-foot-2 passer stays active in the pocket with his feet constantly moving waiting to find the open receiver. The good decision maker has a knack for firing the ball into tight windows and dicing up defenses from all parts of the field. His unorthodox delivery will cause some to take a step back but no poorly timed throws or inaccuracy results from it. From a yardage standpoint, Oklahoma State is near the bottom in the country with an average of 225 yards given up a game. However, the unit has only surrendered four passing touchdowns all season (tied for second in the nation). The quarterback themed-matchup only gets richer when discussing the nation’s leader in passing yards. Rudolph tossed at least two touchdowns in every game this season until traveling to Austin to take on the Longhorns. Rudolph was held in check for the majority of the game last Saturday as Texas’ downfield coverage was nearly flawless. Texas’ defense is on the up and West Virginia has its own secondary to boast. Kyzir White (#8), brother of Chicago wide receiver Kevin, has been a vital piece to the defensive unit so far this season. The big hitting safety has showcased consistent open field tackling along with sticky coverage ability. The instinctive playmaker will have his hands full on Saturday facing the heavy passing attack from Rudolph and a slew of great receivers. It’s time to start talking about David Sills (#13) as a legitimate wide receiver prospect. The junior leads the FBS in touchdown receptions (15) and continues to put out every weekend. Sills doesn’t have elite-level speed but his savvy for the position benefits him more than any individual skill. He wins the 50-50 balls and crushes defenders with crisp route running. The once quarterback recruit is turning into a touchdown-making machine by being a focal point to one of the most potent offenses in football. The Barkley-McSorley combination has been deadly this season and has led Penn State to an unblemished record. The two have combined for 79 percent of the total yards gained this season and have scored 65 percent of the offensive touchdowns. The two’s attention and credit is obviously justified but others that help make the offense go are dancing in the shadows. One of those is senior wide receiver DaeSean Hamilton (#5). Hamilton did his part in the trouncing of Michigan last weekend having caught six passes for 115 yards. Hamilton showcased his top-notch ball tracking skills adjusting well to the ball on deep routes. He continues to win the contested passes in man coverage and did so this past Saturday. Hamilton’s surge to be the No. 1 option for McSorley has taken some time but he looks to be the top target for the All-Big Ten quarterback from here on out. His matchup with potential first round cornerback Denzel Ward (#12) is one of the more attractive NFL Draft-focused matchups this weekend. Ward isn’t the most physical defensive back but Hamilton isn’t the most physical receiver, either. Ward uses his crisp change of direction skills to keep receivers away from the football. However, Ward struggles to consistently get his head around to disrupt the catch point. Hamilton thrives on coming back to the ball and just that single element of the game could be key to victory. It’s hard to believe that an NC State-Notre Dame matchup is one of the more exciting games in the lineup but the top 15 game oozes with next-level talent. The left side of the Notre Dame offensive line is a staple for the Irish offensive attack with Quenton Nelson (#56) and Mike McGlinchey (#68). McGlinchey versus NC State’s premier pass rusher Bradley Chubb (#9) is the best pure scouting matchup of the season. McGlinchey has elite-level foot speed with incredible length and a strong upper body. Chubb will test every bit of that, as he will use his excellent flexibility to bend the edge and attack the quarterback. Chubb’s consistency has made him almost a near lock for a top five pick. The Irish offensive line versus the NC State front four doesn’t stop there. Nelson is one of the most complete prospects in college football. Nelson shows consistency in both facets of the game showing off above average upper body strength with appropriate pass sets and run blocking technique. Nelson will look to contain the brute strength of BJ Hill (#98). Hill is athletic for his size showing great lateral quickness and good enough pursuit speed in the run game to change the runner's path. A player who is already on the radar of many teams, Hill’s stock will only rise with a good performance against one of the best prospects in the game. Division rivalries spark this edition of this weekend preview. The SEC West Tiger duo squares off in Baton Rouge Saturday afternoon where Auburn hasn’t won since 1999. Continuing with the history theme, the Red River Rivalry will not feature Mack Brown or Bob Stoops for the first time since 1998. The pair of attractive scouting games to lock in on in the afternoon is followed by Oregon at Stanford for Pac-12 after dark. Here are some players to watch and matchups to highlight this weekend with a focus on draft-eligible players. The tiger battle Saturday afternoon will not be short of talent. LSU doesn’t have the team resume to make for a national attention grabbing game, but Tiger Stadium will still hold seats for multiple scouts. Derrius Guice (#5) looks to get back on track after an underwhelming performance in last week’s win over Florida. Guice, and his knee, will have to carve through a stout Auburn front seven. Auburn is led by a few talented underclassmen upfront that are not eligible for the draft (come back here next year). One of the trendiest players in the draft media is Auburn edge prospect Jeff Holland (#4). Holland has been a terror flying off the edge constantly impacting passing plays but also providing enough pressure in the run game. Holland shows the ability to convert power into speed by rolling off tackles and then showing the burst to work to the backfield within seconds. Left tackle KJ Malone (#63) of LSU doesn’t have the feet to keep Holland off the edge and coming off a knee injury versus Florida doesn’t help his cause. Look for Malone to gain support from a halfback in certain passing situations. One of the better scouting matchups in all of college football this weekend is Carlton Davis (#6) versus DJ Chark (#7). I highlighted Chark last week and his matchup versus Florida cornerback Duke Dawson and the senior only reeled in one catch. Though Chark showed off his speed and managed to gain 47 yards off his lone catch, he needs to become an ample piece of the puzzle to help the offense trounce a suffocating Auburn defense. Chark’s quick-twitch athletic skills could cause issues for Davis. Though Davis shows the ability to turn and run with receivers down field, he does have issues with covering twitchier athletes underneath. Davis thrives in physical coverage beautifully using the boundary as his friend. Davis could gain a lot of brownie points if keeping Chark in check. (From Sporting News) Losing All-American and potential top-10 pick Connor Williams to a meniscus injury early this season made Texas take a step back on the offensive front. Williams left a big hole to fill at the left tackle position, and his permanent replacement hasn't been found yet. Tristan Nickelson has stepped in to play the position for now, leaving true freshman Derek Kerstetter to start the last two games on the right side. The unit hasn’t found the continuity it once had with Williams, but is making strides entering this weekend. An impending matchup up against defensive end Ogbonnia Okoronkwo (#31) and the rest of the OU front seven will tell how far this line has come without its anchor. Okoronkwo is the Sooners’ primary pass-rusher playing a versatile role on defense. The 6-1 senior shows his edge presence rushing the passer from an upright position. He has shown that he can with quickness from the upright position, often embarrassing offensive tackles and then exploding toward the quarterback. His spin move takes one step to get into the backfield and his flexibility is a huge advantage going up against longer tackles with flexibility issues (Nickelson is 6-9). Okoronkwo also makes an impact in coverage by patrolling the flats and intermediate areas of the field. It’s hard to avoid the dangerous defender, and the Longhorns must scheme to avoid his impact. He doesn’t allow the offense to get comfortable, constantly baiting quarterbacks and tackles into rushing or over-pursuing. Mayfield’s impressive stat line doesn’t stem from a plethora of easy dump passes that increase his completion percentage. Though the senior makes some passes behind the line of scrimmage, Mayfield has the arm strength to consistently and accurately push the ball downfield. The Heisman candidate has yet to throw an interception on 134 attempts this season and hasn't committed a turnover through the air in the last seven games. He has thrown at least two touchdowns in the past 18 games, including 11 three-touchdown games. Baker Mayfield (#6) will finish with one of the better quarterback ratings in college football history, and that is no secret. And Texas knows how dynamic the All-American is. Creating pressure and defending against the long ball is key for a Texas victory. Mayfield can dice up a defense all afternoon with 10-yard throws here and there, but removing the deep ball from the Sooners' playbook can keep the momentum in check. That’s what Iowa State managed to do. ​Mayfield finished the day with an efficient outing, completing 24 of 33 passes for two touchdowns. Accounting for dropped passes, his adjusted completion rate against the Cyclones was an astounding 84.8 percent. 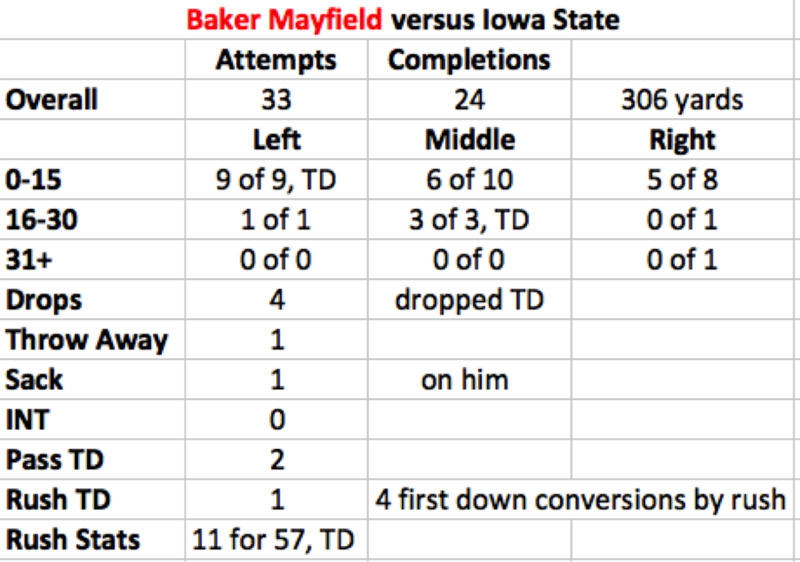 Looking at that and thinking that Iowa State kept him in check may be a surprise, but with the vertical passing style offense Oklahoma favors, Mayfield’s longest completion was 29 yards. Mayfield’s longest completions in the previous five games were 51, 42, 82 and 52 yards, respectively. Making the Oklahoma offense string together long drives will only benefit the defense. Mayfield’s dynamic ability is hard to bottle up. Keeping the playmaker from getting in rhythm underneath and connecting on the long ball gives the 7.5-point dog Longhorns a legitimate shot to come away as victor in the Red River Rivalry. A consistent piece on the Oregon offensive line, Tyrell Crosby (#73) has been spectacular this season. Crosby isn’t the most fleet-footed tackles out there but carries enough behind his pads to use as a trump card to his average feet. Crosby is a road grader in the run game showing off his natural strength with overwhelming power. The senior does well blocking for running back Royce Freeman (#21) in the downhill run game. Freeman isn’t the quick, change of direction back that most think of when thinking about past Oregon backs. Freeman is a build-up speed type back that doesn’t have the fluidity or change of direction skills to be much of a threat in the open field. His vision and power, with adequate flexibility, create for positive yardage. All 10 of Freeman’s touchdowns have come in the redzone. Stanford doesn’t boast any top 100 prospects in its front seven like usual, at this moment, and is having one of its worst rushing defensive performances in over the past 10 years. Stanford cornerback Quenton Meeks (#24) has picked up plenty of steam lately. His 6-2, 205-pound frame definitely helps his intrigue as a prospect. Meeks is a risk taker and a quarterback baiter when in coverage. He stays controlled in his movements with sticky coverage ability staying in the hip pocket of receivers. His instinctive style of play is evident and he shows the ability to stay on par with the quicker receivers. Saturday night is when that will be put on display as Meeks battles an always-speedy Oregon receiving corps. However, especially now with quarterback Justin Herbert out, Oregon doesn’t have a top 20 pass catcher (per receptions) in the Pac-12. It’s a heavy week with plenty of next-level head-to-head matchups that started Thursday night. The Louisville-NC State game is not featured in the preview but defensive end Bradley Chubb solidified his status as a top five pick when embarrassing left tackle Geron Christian of Louisville. The same theme will continue into Clemson, South Carolina, when an effective Wake Forest defensive front faces off against an average front five of Clemson. Florida State and LSU have had rough starts to the season but have a chance of redemption, or the opportunity to get back on track, with wins over ranked opponents this weekend. Both teams need big games from its stars to pull off the upset. Wake Forest nearly sent Florida State home with a 0-3 record, which would have been its worst start since 1976. Even with the loss, the Demon Deacons are still rolling. Its offense has seen a 100-yard increase in total yards per game (419) and the unit is averaging 14 points more than last year’s squad. Clemson, well, they’re still good. Wake Forest defensive end Duke Ejiofor (#53) was a pest last week versus Florida State. The senior racked up eight tackles, 3.5 for loss, a sack, a forced fumble and a quarterback hurry. Ejiofor continues to impress with his length and his explosiveness off the snap. His go-to is a swim move in which his length and quickness makes it difficult to defend. Ejiofor did most of his work from the right end position last weekend and if sticking to that same area, that makes for a potential Round 1 matchup versus Mitch Hyatt (#75). Hyatt has heavy mitts and works them well into the chest of the defenders. He will quickly counter his matchup by slapping away their hands. His transitional skills into the second level are smooth-like displaying plush feet. He is an initiator and not a hugger, which will be interesting to watch on Saturday. Ejiofor has the body control and quickness to elude early movements by blockers then makes the magic happen. This game tape will be on replay across many NFL decision makers’ desk for both players come drafts season. All-ACC linebacker Kendall Joseph (#34) doesn’t get mentioned all too often when discussing the Clemson defense. And though the ones in the trenches deserve a numerous amount of praise, Joseph has been every bit as effective and important during the Tigers’ title run. Joseph is more prevalent in the passing game than defending the run, which is not a description that is normally tossed around for a linebacker. Joseph has enough range and speed to cover the flats and anything in the intermediate levels of the field. Joseph’s impressive pass coverage ability will be tested by one of the most sure-handed receivers in football. Senior tight end Cam Serigne (#85) doesn’t overwhelm opponents with his natural athletic ability but rather with his crisp route running skills and natural hands. The 6-foot-3, 250-pound tight end prospect constantly threatens the seam to either supply himself for being an open target or provide more room for his colleagues underneath. Serigne has nine catches on the season and four of them are touchdowns. The game itself will most likely not feature fireworks or a lot of bells and whistles but the game will guarantee a lot of scouts in attendance taking note of next-level talent. LSU fell flat, to phrase it nicely, last weekend when hosting Troy. The Tigers were without dangerous runner Derrius Guice (#5) but still no excuses. Florida still shows to be an up and down team but looks to be headed in the right direction averaging 431 yards of total offense over its past two SEC wins (Kentucky and Vanderbilt). Though listed as probable with a knee injury, Guice’s reliability may not be that great in the game. With that, LSU needs to find its next best playmaker, as it showed is very possible in last week’s loss. The receiving corps stepped up to the plate and delivered with senior wideout DJ Chark (#7) leading the way with four catches for 105 yards. Chark is a speedster that uses his quick-twitch athletic skills to operate down the field or in the intermediate part of the field after the catch. Chark looks to have bulked up this offseason and has shown instances of winning contested catches benefitting with that added strength. Florida’s stingy secondary continues to make the push for DB U. Duke Dawson (#7) will get the task of keeping Chark in check. Dawson doesn’t give much comfort against all types of receivers as he plays with appropriate game speed and has the ability to mirror receivers by staying in the hip pocket of them. His physicality may not be tested as much to be a factor but that can be something to keep an eye on in the red zone. Dawson is a solid tackler in the open field and a prized run defender. A fun scouting weekend consists of a lot offensive tackle versus defensive end matchups. Thursday night kicked off with Christian of Louisville matching up with Chubb of NC State. As noted previously, the Clemson game at noon features Ejiofor and Hyatt. The SEC afternoon kickoff boasts one of the most gifted speed rushers in football with Arden Key, LSU, versus versatile offensive lineman Martez Ivey, Florida. Key (#49) has tremendous burst and can explode up field with some underrated strength at the point of attack. Ivey (#73) shifted from guard to tackle to help provide for better outside protection filling the vacancy left by David Sharpe. However, Ivey’s transition has been fine but nothing that screams top 50 pick. Ivey is not the smoothest athlete and has a hitch when attempting to catch speed. Key’s main tool is to get to the quarterback with his balanced athleticism and plus-speed. This matchup is more of a gauge for Ivey than it is Key. (From Sporting News) Coming into the season, Auden Tate (#18) had caught only 25 passes in his career. He already has more than half that total entering Week 6 (through just three games). Becoming the favorite, and most reliable, target for quarterback James Blackman has helped the young quarterback become more comfortable each week. Tate is virtually open on every route. The 6-5, 225-pound junior uses his size to box out defenders. Using his frame to shield off potential breakups, Tate maintains control to cradle the ball from below his waist. Or he can use his leaping ability to snag a pass above his head. He showed speed and boxing out ability in the game-winning touchdown catch versus Wake Forest last week. Tate also can be a threat downfield, not limiting him to the intermediate part of the field where he is equally as dangerous. The junior’s long strides eat up turf quickly, and though he may not run by defenders constantly, he uses his size as an advantage. His superb ball-tracking ability gives him a shot at any ball thrown down the field. Tate’s biggest test physically was against Alabama’s slew of NFL-caliber cornerbacks. In that game, he caught just two passes, and even though they went for 41 yards and a touchdown, he couldn’t seem to budge the secondary after that. He has not seen equal physical coverage the past couple weeks, but that will change this weekend. Dee Delaney (#3), a graduate-transfer from The Citadel, has been lockdown ever since he put on a Miami uniform. Delaney makes his presence known by being extremely physical at the line of scrimmage. The 6-1, 193-pound cornerback packs a punch in press coverage by jolting receivers back and instantly affecting the integrity of the route. His physical nature suits well when battling with Tate and his ability to use his frame to his benefit. It should be a war with these two All-ACC candidates going at it on Saturday. Tate has shown to be the x-factor for the ‘Noles and this matchup is a defining factor in the outcome of the game Saturday evening. ​Primetime college football comes early this week with USC traveling to Washington State on Friday night. The quarterback duel occurring in Pullman is the headliner of the matchup but there are also plenty of matchups to pay close attention to upfront. The Saturday primetime game consists of Clemson and Virginia Tech with plenty of talent on both sides of the ball for each team. Northwestern looks to play spoiler over No. 10 Wisconsin. The headliner of this game circles around the quarterback duel between USC’s Sam Darnold (#14) and Washington State’s Luke Falk (#4). Darnold has had his ups and downs this season but without him, the Trojans would currently be treading water to stay afloat. Falk has plenty of naysayers stating he is just a product of the system and has no NFL future. A win over a talent-laden defense could give those naysayers a new perspective. Even with the quarterback play being so crucial in his cross-divisional showdown, the game will be decided upfront. The Cougars have a couple of individuals on the offensive line that project as mid-round prospects, but the unit has yet to develop as a cohesive unit. The offensive line has surrendered 14 sacks, which ranks 124 in the FBS. USC has forced 11 sacks. Washington State right tackle Cole Madison (#61) has been a consistent top grader on Pro Football Focus: College Football. The senior isn’t the most fleet-footed tackle but has an effective enough kick slide and balance to catch speed off the edge. Uchenna Nwosu (#42) will test all angles of his game. Nwosu can win at the point of attack with power but also a string of pass rush moves (club, swim, rip) to get into the backfield. Keeping the theme of Washington State attempting to win the battle at the line of scrimmage, left tackle Andre Dillard (#60) has his hands full with Porter Gustin (#45) firing off the edge. Even at 6-foot-5 and 310 pounds, Dillard will show an area of weakness when being bull rushed. Being a waist bender doesn’t help his cause versus the force of Gustin. Gustin wins at the point of attack with power but has enough athleticism to peel around the edge to create pressure. Virginia Tech wide receiver Cam Phillips (#5) enters the game as the nation’s leading receiver with 532 yards. Two weeks ago versus East Carolina, he set the school record for most receptions in a game with 14. Phillips, listed at 6-foot, 202 pounds, shows a constant determination to snag the ball out of the air with plus leaping ability and reliable hands. His physicality surprises many due to his size but he has the strength to come down with plenty of contested catches. Phillips shows off constant instances of winning at the catch point but also has plenty of creativity and moxie during his routes and after the catch. His effective jab step keeps defenders guessing all while accounting for his subtle quickness in the open field. Clemson is known to have high-level defenders in its secondary. The Clemson defense has only surrendered one 100-yard game to a receiver this season (Traveon Samuel, Louisville, two receptions, 100 yards). Keeping the trend of not letting a single receiver determine the outcome of a game is a theme the Tigers would like to keep trending on the defense. Clemson made Lamar Jackson look average in its win over Louisville. The Tigers limited the junior to completing only 50 percent of his passes for 317 yards and minimized his usual overwhelming rushing total (64 yards). Defensive coordinator Brent Venables sends pressure from many different angles of the field. The Tigers rely on defensive bookend pass rushers to squeeze the pocket and for its dominant defense tackle combination, Dexter Lawrence (#90) and Christian Wilkins (#42), to create havoc between the tackles. Virginia Tech will test the Clemson front seven in multiple ways as it presents its balanced offensive attack headlined by redshirt freshman quarterback Josh Jackson. Wildcat quarterback Clayton Thorson (#18) got back on track last weekend with a strong performance versus Bowling Green (23-30, 370 yards, 2 TD). Before being evaluated as a top 100 player in the 2018 NFL Draft, Thorson must show more consistency and it starts versus Wisconsin on Saturday afternoon. In 11 games versus ranked teams as the starting quarterback, Thorson and the Wildcats are 4-7. During that span, Thorson averages 164 yards per game with a 54.8 completion percentage (8-8, TD-interception in the 11 games). Thorson attracts scouts with his athleticism that complements well with his 6-foot-4, 220-pound frame. The pocket passer is generally a good decision maker and showcases a big arm. Thorson and the Wildcat offense do not test the waters down the field much but this offense has the playmakers and quarterback to attack the deep part of the field. The biggest matchup to highlight in this matchup is how well can Wisconsin defend the rushing attack from Justin Jackson (#21). The senior running back struggled against Duke (the whole Northwestern offense did) but got back to basics versus Bowling Green in the Wildcats’ 49-7 rout. Jackson may not compare to the top backs with great speed or power, but the senior shows plenty of translatable skills to be drafted without hesitation. Running with a low center of gravity with appreciated pad level, Jackson wins with vision and technique as a runner. The matchup to watch involves Jackson and underrated Wisconsin linebacker TJ Edwards (#53). Edwards is an instinctive player in the run game and shows enough athleticism to take on multiple responsibilities. Edwards can play near the line of scrimmage but can also stay back and play excellent in pass coverage. A quick comparison for Edwards is a bulkier version of Tennessee Titans rookie Jayon Brown. Winovich has already matched his sack total from a season ago in just four games. His 5.5 sacks rank third in the nation and his 7.5 tackles for loss are tied for sixth. Winovich was overshadowed by a heavily talented defense for the Wolverines last season but now is creating enough noise to make a name for himself. Tate was the silver lining in the Seminoles lost last weekend to NC State. Tate proved his worth reeling in nine receptions for 138 yards and one score. Tate’s 6-foot-5, 225-pound frame jumps off the page as an intimidation factor and he uses it to his advantage. Holland has been near unblockable so far this season for the Tigers. Holland shows a nice blend of speed and power when rushing the passer. The junior’s burst off the line of scrimmage compares to the get off similar to that of Arden Key and Harold Landry. Holland matchup versus Mississippi State’s Martinas Rankin will be used as gauge for his progression. Nichols is an aggressive sticky cover corner that yearns for a bigger spotlight. His physicality is used as a trump card for his 5-foot-10 frame. Nichols has the ability to mirror receivers and redirect their movements. USF’s quest for 12-0 should help Nichols’ spotlight grow larger in the scouting world. ​College football gives us two ranked matchups this weekend with No. 16 at TCU at No. 6 Oklahoma State and freshly ranked No. 17 Mississippi State at No. 11 Georgia. Both Bulldog clubs have captured signature wins so far this season and are looking for one more. Both UCLA and Stanford suffered non-conference losses to Group of Six teams and look to get back on track with their first win over a Pac-12 opponent. Cowboy quarterback Mason Rudolph (#2) ranks second in the nation with 11 touchdowns and fifth with a passer rating of 210.3. Rudolph thrives in Mike Gundy spread offense with a handful of play-making weapons around him. The senior has improved on his touch downfield as he has diced up any defensive strategy thrown his way so far this season. Kenny Hill, TCU quarterback, carries a high completion percentage rate (75 percent) into Stillwater but has had moments of vulnerability. Hill boasts an 8-2 touchdown-interception ratio and both of his interceptions have come when throwing into triple coverage. Hill shows a massive amount of arm talent, but sometimes that gets in his way. He played near flawless against SMU and maybe calmed down to go with the safer option instead of risking a big gain into congested areas. Trying to contain Oklahoma State’s wildly talented receiving corps is a tall order for the TCU secondary. Most notably, James Washington (#28), NCAA’s active career leader in receiving yards, wins with elite-level body control, top-notch ball tracking skills and winning at the catch point on a consistent basis. The best defensive back on the Horned Frogs squad is cornerback Ranthony Texada (#11). The senior jumps off the page with instincts and grit but his 5-10, 170-pound frame does prevent him in some 50/50 opportunities, which could be problematic when playing against a receiver that thrives in congested situations. Unfortunately for TCU, the receiving threats don’t start there. Marcell Ateman (#3) has been a pleasant surprise in 2017, reeling in as many receptions as Washington (13) with 235 yards and three scores. Ateman is a big-bodied wideout that can win in numerous ways. His speed can test the defense vertically threaten multiple levels of the field and his natural hands and leaping ability make it tough to throw a ball out of his catch radius. Ateman could give fits against an undersized TCU secondary. Georgia’s attractive defensive line recruiting class from a few years back is now in full focus. Senior defensive end Davin Bellamy (#17) proved his high billing in Week 2 versus Notre Dame cross facing coveted Notre Dame left tackle Mike McGlinchey multiple and creating pressure in the backfield (I don’t think McGlinchey played bad in that game, though the media says otherwise). Bellamy uses his quickness to outweigh his weaker upper body when faced versus SEC left tackles. His rapid hand technique develops a constant frustration for opposing tackles. One tackle that has been fazed by speed and quickness in the past is Bellamy’s matchup this weekend. Martinas Rankin (#55), Mississippi State left tackle, thrives in a run drive blocking setting but can struggle in pass protection. Rankin has long arms and strong mitts to combat with any bull rusher but when his matchup takes a quicker route to the quarterback. Bellamy wins with a swim over the top and shows the ability to dip his inside shoulder to bend around the tackle. Rankin’s balance and technique will be put to test quickly. Rankin graded out well last week versus LSU. Though quarterback Josh Rosen (#3) has faced a fair share of stiff opposition so far this season, his biggest test may come from the always-stout Stanford defense Saturday night. Even in the somewhat surprising loss last weekend at San Diego State, the Cardinal only surrendered 353 total yards and amassed six sacks in the losing effort. Rosen boasts the best throwing mechanics, with a symmetrical base, in the country but things seem to go eerie when pressure is involved. The heralded junior shows moments of poise in the pocket when pressured, but also tend to play hero ball and make something out of nothing when nothing would be the better decision. Eight different Stanford defenders have notched a sack so far this year so pressure will be flying in every which direction for the potential first round pick at quarterback. In attendance last week for the UCLA at Memphis game, I noticed how poor the UCLA front seven is. Not being able to cover simple run plays or adjust to anything Memphis threw at them with consistency, UCLA gave up 560 yards but did manage to buckle down on third down (Memphis was 3-12 on third down). With the Bruins inconsistent front seven, Stanford running back Bryce Love (#20) may have a hay day. On just 43 carries, Love has an overwhelming 534 yards and four touchdowns. With impeccable vision and an above average cut back, the 5-foot-10 junior does plenty of work in the backfield before even passing the line of scrimmage. When in the open field, Love shows off smooth change of direction skills cruising back defenders after contact. His natural strength and instincts should give UCLA fits all night long. After two weeks of attention-grabbing matchups, many players have made enough impact to either rise on the consensus draft board or plummet. One to rise is no other than Heisman Trophy winner Lamar Jackson. Jackson wows with this athletic ability, but many are still not sold on his passing technique, though, he constantly manages to prove them wrong. Jackson and the Cardinals will battle Clemson on Saturday night. Florida has just one game in its pocket and it was a poor performance versus a stout Michigan front seven. The Gators matchup with Northern Colorado got canceled so we have yet to see what improvements and changes the Gators have made offensively. USC and Texas meet for the first time since Vince Young’s 467-yard performance in the 2006 national championship. Both teams faced a perceived-to-be even out of conference foe Week 1. Florida failed to move the ball on offense amassing just 192 yards of total offense and nine first downs (lowest totals in 2016, total offense: 207 at Florida State; first downs: 11 versus Iowa). Unsure if the Gators have figured out its offensive kinks, Florida canceled its game last weekend versus Northern Colorado because of hurricane complications. Tennessee, however, capitalized on Georgia Tech’s turnover late in the game to force the game in overtime and later win. Neither team showed to be an offensive juggernaut in their openers, but both teams sport a hefty amount of NFL talent on that side of the ball. Running backs Jalen Hurd and Alvin Kamara stole the spotlight last season, but lost in the mix was John Kelly (#4). Kelly averaged a team-best 6.4 yards per carry and has continued that trend so far in 2016 (5.6 yards per carry). Kelly does not have an overwhelming burst, but has enough speed to slingshot out of the backfield to get chunk plays. The powerful runner shows a consistent leg drive that prevents him from getting caught in garbage in the backfield. The junior will battle it out with an always-strong Florida front seven. As for Florida’s offensive firepower, most of the playmakers are still out. No update has been given for the status of wide receiver Antonio Callaway (#81) and running back Jordan Scarlett (#25) who were suspended, along with eight other players, versus Michigan. Without these two it will be difficult for the Gators to find any rhythm on offense. However, the defense still looks to be a strong unit overall. Defensive end Cece Jefferson (#96) was a constant pass rushing threat in Week 1. The junior is credited with one sack on the season with 2.5 tackles for loss. Viewed as an undersized player for the position, Jefferson has the strength to win at the point of attack and control his opposition. He needs to develop more of a skilled set of pass rush moves when pursuing the quarterback. The SEC East showdown consists of some unknowns, especially when evaluating the Gators after Week 1 on a shortened roster. After an encore-worthy finish under the lights a year ago, two of the ACC favorites battle it out early in the season. Clemson is riding high off one of its better all-time defensive performances versus Auburn (11 sacks) and Louisville, Jackson, continue to show its offensive firepower in multiple facets. Jackson’s (#8) draft stock has been all over the place this preseason and the critiques, accurate or not, of his style of play and NFL projection continue to snowball into the season. Jackson has improved his pocket presence and overall awareness in reading a secondary and all were in display last week versus North Carolina. The Tar Heels’ secondary has some notable prospects on its defense but none to the caliber of Clemson’s strong defensive unit. Clemson junior cornerback Mark Fields (#2) had an excellent performance last weekend locking down multiple receivers on what is supposed to be an explosive Auburn offense. Head to head, Fields and his opposition, Jaylen Smith (#9), is one of the more intriguing matchups this weekend. Smith is a multi-threat receiver that can abuse the defense in many different ways. His sub-4.6 speed can knock the top off a defense but his subtle quickness and burst in the intermediate area of the field constantly keep defenders guessing. Fields checks the boxes athletically and relies on technique to win his battle. Fields is on the move to becoming a riser on draft boards. A crucial piece to a Louisville victory is the status of All-American caliber cornerback Jaire Alexander (#10). Alexander is a smooth athlete with plenty of upside. His sticky coverage skills and confident attributes are key versus a trio of receivers consisting of Deon Cain (#8), Ray-Ray McCloud (#34) and Hunter Renfrow (#13). Alexander is currently nursing a knee injury suffered in the Cardinals’ season opener versus Purdue. Alexander’s status still remains uncertain. Alexander’s best film of his career came versus Clemson last season, including this interception (GIF). Clemson’s defensive front is one of the better units top to bottom that college football has seen in recent memory. Its overwhelming performance against Auburn last weekend stamped that statement with approval. Clelin Ferrell (#99) created plenty of pressure from his right defensive end position last week but will face a more experienced and reliable opposition on Saturday night. Coveted left tackle Geron Christian (#74) of Louisville was the lone bright spot on a bad Louisville front five a year ago. Christian has a pair of swift feet, basketball background, and a controlled kick slide. The 6-foot-6 junior plays well versus speed and constantly hits his target with active hands, as seen here (GIF). That will be key versus Ferrell’s flexibility and constant motor on Saturday. Containing Jackson within the pocket is no easy task. And even if kept in the pocket, the junior defines what it takes to be a dual-threat quarterback. Tiger linebacker Kendall Joseph (#34) has his work cut out for him. Joseph shows equal ability to be a sneaky pass rusher and a stout run defender. His decisiveness and athletic ability will be tested by Jackson’s rare athleticism for the position. Joseph and Fields may have the most to gain out of any Tiger this weekend. The media guide may not mention its loss to the Longhorns in the 2006 Rose Bowl, but USC still seeks revenge. Neither program has seen prominence in the past few years as it did similar to the teams that resurrected the 2006 teams. Maryland embarrassed the Longhorns at home Week 1 but all is forgiven if Tom Herman can rally his squad and defeat the Trojans in Los Angeles. As for USC, the Trojans’ preseason expectations are nothing short of a Pac-12 title and a push for the playoffs. After a win over, now, bitter rival Stanford, The Trojans are poised to make noise on the national level. Texas boasts left tackle Connor Williams (#55) as its prized NFL Draft prospect. The junior shows consistency winning at the point of attack, instantly striking the pass-rusher with long arms and tremendous upper body strength. His appropriate footwork gives him the ability to catch speedy rushers off the edge. No matter what side the coveted edge rushers for the Trojans line up on, Williams will have his hands full. Porter Gustin (#45) is better known for his consistency in stopping the run, but also creates plenty of pressure in the backfield as a pass rusher. The junior defensive end recorded 44 pressures last season (best among returning outside linebackers in Pac-12, according to Pro Football Focus). Uchenna Nwosu (#42) brings more speed and consistency as a pass rusher. The senior recorded five pass breakups, four tackles (one for loss) and a sack last week versus Stanford’s usual stout offensive line. Complementing his athleticism with awareness, Nwosu constantly plugs passing lanes while also being a pesky pass rusher. Prized 2015 recruit Malik Jefferson (#46) came into Austin with outrageous expectations and, though, he has been solid for the Longhorns, he hasn’t yet lived up to the high billing. Jefferson is an effective run defender as his instincts jump off the page constantly meeting the ball carrier in the hole. His tackling technique is inconsistent and has led to missed tackles. The 6-foot-3, 238-pound junior has enough flexibility in his lower body to play sideline to sideline, however, his motor runs hot and cold preventing him from making plays all over the field. Matching up against the shifty and powerful Ronald Jones (#25) of USC will be a good measuring stick to see how effective Jefferson really is.